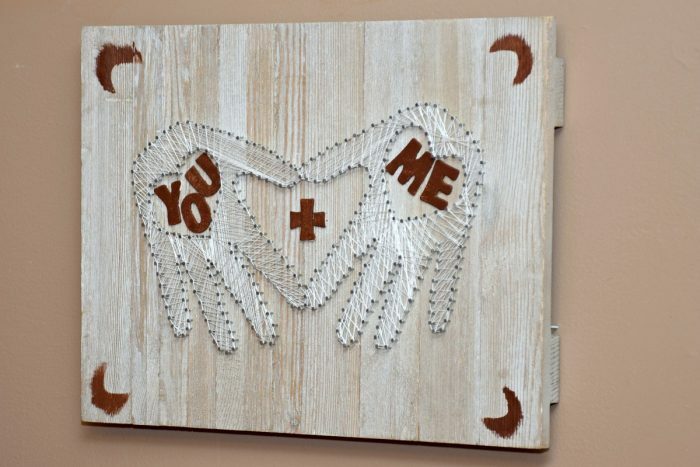 I recently created and hung a hand/heart string art creation in our room. When I was a child, my mom had these two string art sail boats that hung in the guest bedroom. Like Anne of Green Gables, I had a slight fascination with that room. It was always quiet and sort of mysterious in there. I would sneak in and look at the wall paper with the prints of gentlemen and ladies lounging under trees, strolling by the stream and I think there was another scene on the wallpaper but I forget. The walls had different decor than the rest of the house as well. The sail boat string art decorations were my favorites. I would run my fingers over the nails, trace the top strings back and forth from nail to nail and of course give a tug on the strings here and there, you know, to “make sure they were tight”. 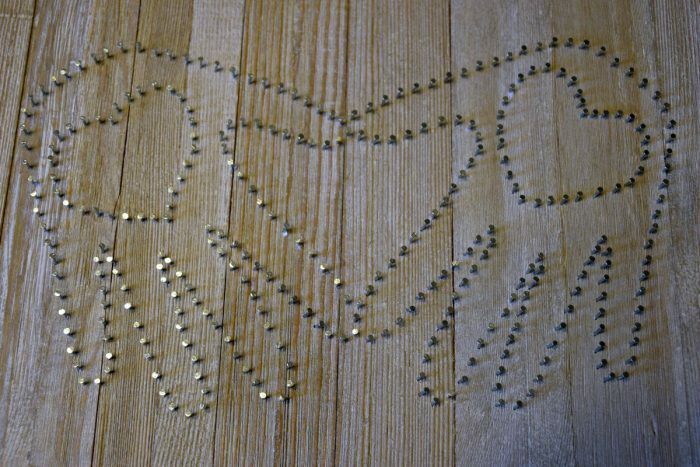 Now string art is in again and the designs and styles are limitless! 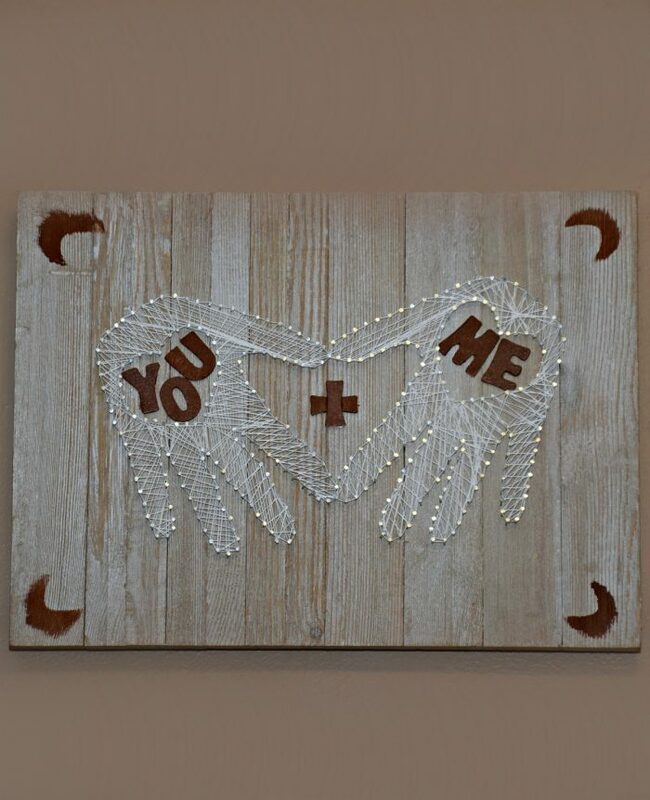 Why not make this sweet hand/heart string art decor as a gift for your significant other or as a new piece of decor for your home? I have a mother’s day idea I want to do with the heart in hand idea too, I’ll share it here as well if I make it. 18 Gage wire nails. I used an entire 2oz pack plus a few from a second pack. String. For a more filled in look, go with crochet thread. I wanted a delicate, light look so went with 3 strands of embroidery floss. Paper and pen for creating your pattern. Wooden letters. 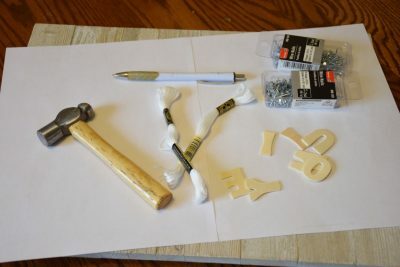 Plaid crafts has packages of letters that works perfect. Paint. This is optional but I used it for the letters and a bit of accent paint on my actual board. Start by creating your pattern. You will need to tape two pieces of copy paper together for the correct size. 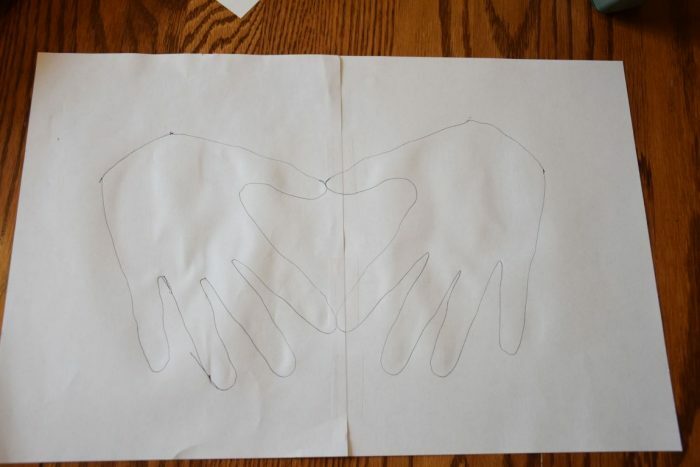 Trace your left hand, holding your thumb and forefinger in a way to create half of a heart. 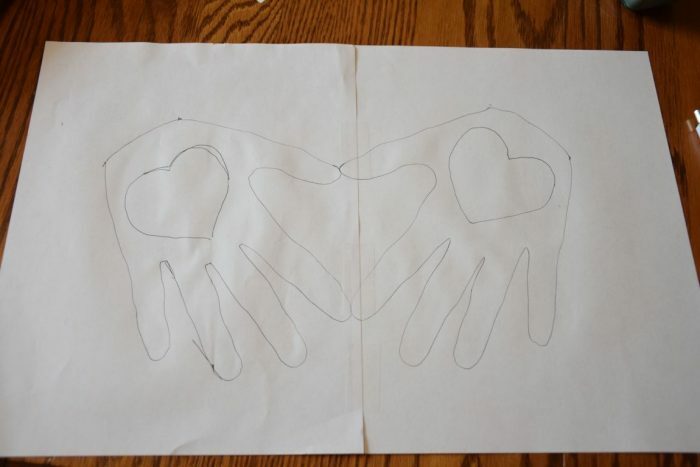 Then lay your right hand on the paper, lining up thumbs and forefingers to finish the heart shape, trace your right hand. Now, lay the wooden letters inside the palm of each hand. 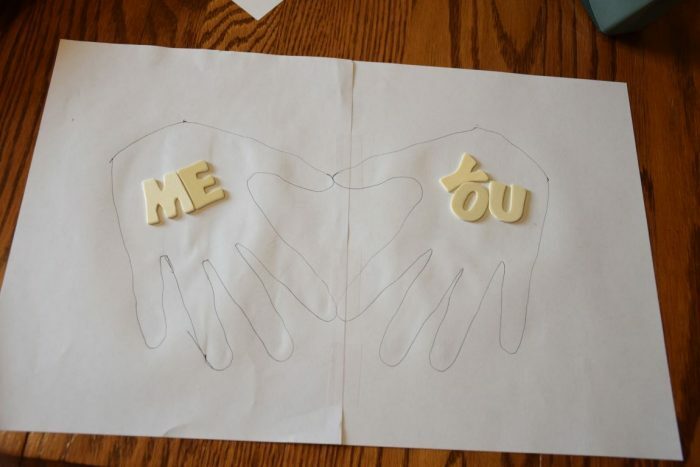 You can do the YOU + ME like I did, or initials. Nestle the letters as close as you can and draw a heart shape around them. 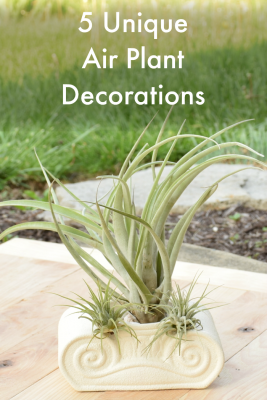 Now that you have your pattern, tape it to the surface you will be creating your string art on. Time to start hammering! 1/4″ spacing works the best, I didn’t measure after the first few so the spacing isn’t perfect but it’s all part of the charm! Pounding them in an equal amount is also tricky, I tried to leave 1/4″ of nail up. 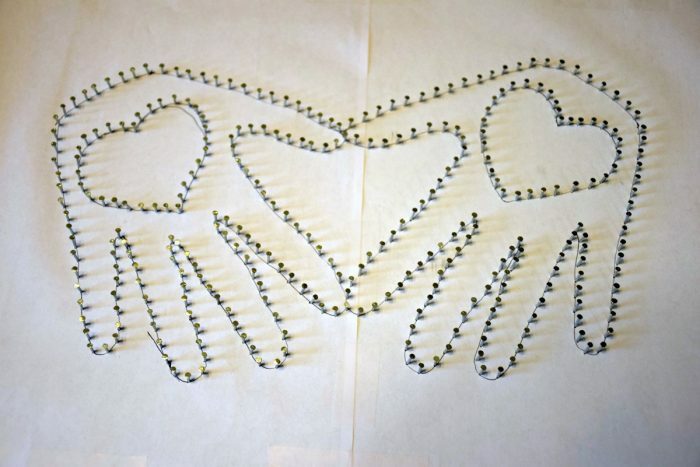 Make sure the adjoining thumbs and forefingers share a nail where they connect. The forefingers actually ended up sharing 2 nails. Make the pounding a little quieter by placing a rug or something under your board. This reduced the echoing a lot! Whew! That was a lot of pounding! Once all the nails are in place, lift the pattern off. It’s so fun seeing a project start coming together! My toddler also enjoyed the pounding process. He faithfully handed me nails the entire time, playing with them too. Time to start stringing! 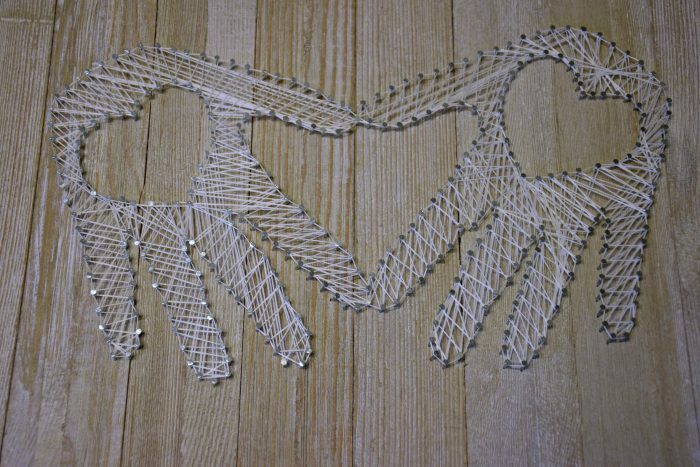 There’s no right or wrong way to string this hand/heart string art. I choose to do a mix of long and short wraps, for variety. I also left it somewhat open and “airy”. You can leave it open, or fill it in until you cannot see the background at all. As you are stringing, try to keep pressure on the string and wrap as tightly as possible. Of course, wrapping tightly can cause a few minor issues if you are using a board like I am. Where the nails are in the gaps (I tried to avoid them as much as possible), the string often moved them a little. 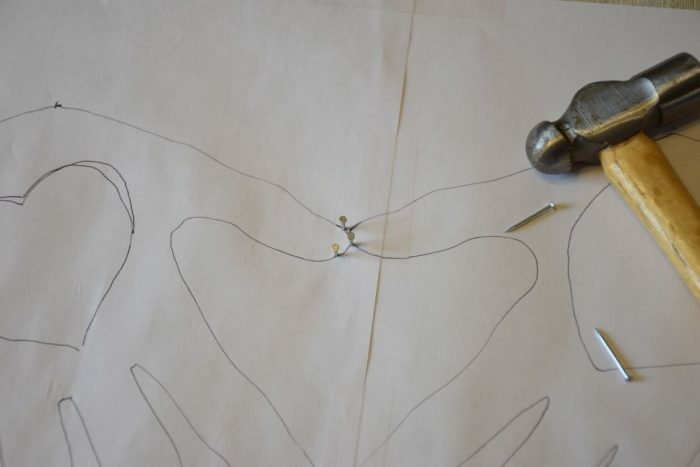 Once you’ve filled in the hand, outline the inner heart and the outer hand by wrapping the string around once. I did one hand at a time, and it’s pretty clear that I did the right hand (left side) first as it doesn’t look as nice. Finishing Touches. Time for the letters! I painted mine brown so they would stand out a bit. Once dry, I glued them to the board. Then, because I didn’t like the blank corners, I painted a little accent piece. 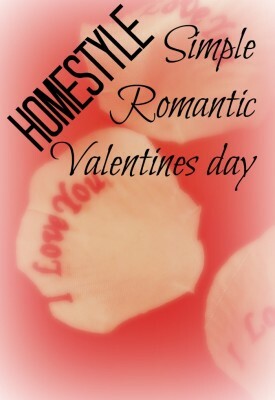 Hearts would’ve been nice, but I didn’t have a stencil and free hand painting is not my thing at all! 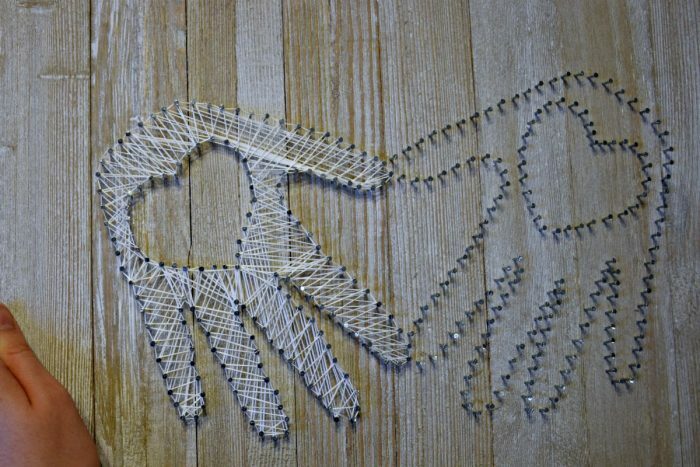 If you decide to create your own hand/heart string art, please share it on Facebook or Twitter and tag @aproverbs31wife I would love to see it! This is such a great idea and would have been amazing behind the head table at my daughter’s wedding last year. Pinning because my son just got engaged! This is a great idea! I have wanted to try string art but just never seem to do it. Thank you for sharing at Merry Monday! You should definitely give it a try! I really had fun with it and it’s so easy to do! Kendra, this is so “heart”felt! I love it. I would probably ask my hubs (if I had one) to let me trace his hand, and mine the other.